Tony Kanaan knew it would be tough to win on the Richmond International Raceway with 26 starters - half of whom were making their first appearance on the 0.75-mile oval. But this tough? The race in Richmond was, let’s be honest … a destruction derby. The race felt as though it would run a couple of laps and have to go to yellow flag conditions (105 laps of the 300 run) to clear up yet, another car getting light in the rear (I believe the term Jaime Camara used was “neutral”), swing around, and hit the SAFER barrier. The Fine Nine (the drivers fielded by teams transitioning into the IRL from the CCWS) did not do fine here in Richmond. The ones who finished, did well … but the rest of the T-Team field checked out early and/or often. The three drivers who did finish the race all finished in the top ten with Oriol Servia of KV Racing Technology posting a personal best fifth out of twenty-six cars who were entered in the race. The Fine Nine drivers checked out in the following order on this, the shortest oval the IRL competes on all season. In the final laps, only twelve of the 26 cars were running on the track. As far as Rookie Of The Year honors race is concerned, Heideki Mutoh of Andretti Green Racing (out on lap 220 and finished in position 13) still leads in the points but lost a little ground back to Servia, Justin Wilson of Newman/Haas/Lanigan Racing (position 7) and EJ Viso of HVM Racing (position 10). Kanaan kept the No. 11 7-Eleven car clear of multiple potential mishaps to claim his first victory since Belle Isle last September and his first on an oval since Kentucky in August. The pole sitter held off Team Penske's Helio Castroneves, who advanced 16 positions through furious driving and attrition for his fourth second place of the season. 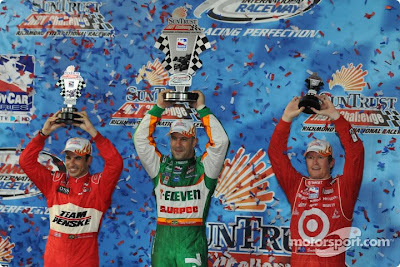 Target Chip Ganassi Racing's Scott Dixon overtook teammate Dan Wheldon on the final laps for third and score valuable championship points. 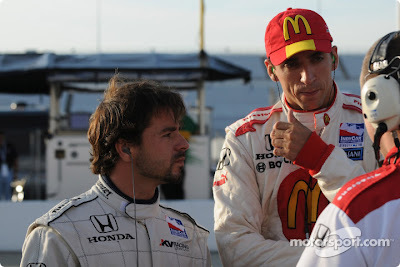 KV Racing Technology's Oriol Servia finished a career-best fifth on an oval. "It was a tough night," said Dixon, who takes a 43-point lead over Castroneves into the race at Watkins Glen International on July 6. "TK definitely looked pretty strong tonight." Wheldon is third in the standings (299 points) and Kanaan (269) is fourth. The 300-lap race (lengthened 50 laps from '07) under the lights was marred by 105 caution laps. The IndyCar Series record is 116 at Nazareth Speedway in 2002. Andretti Green Racing's Danica Patrick finished sixth and Justin Wilson moved up 16 spots to seventh (tying his career best on an oval). Townsend Bell in the No. 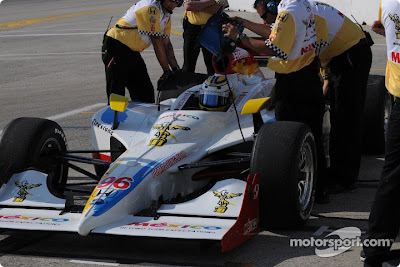 23 Dreyer & Reinbold Racing car finished eighth and Marco Andretti was ninth. Andretti completed 135 laps (many under caution) on one 22-gallon load of ethanol. "What a crazy race," said Wilson, who started 23rd. "There was some really good driving and some really bad driving out there. I was just trying not to get caught out and stay out of trouble and bring the car home. The McDonald's car wasn't the quickest car out there today but we managed to salvage some good points and hopefully that will help us out in the championship." Finally, next week the former ChampCar teams get some meat to chew on and they will be at full strength. Pacific Coast Motorsports will be re-joining the competition for the rest of the season. Mario Donimguez driving the Visit Mexico City Dallara will be backed by a group of PCM team members that have experience racing at Watkins Glen. This, from a recent press release; Veterans of Champ Car and Sports Cars, PCM looks forward to their return to road courses. The historic Watkins Glen track is familiar to PCM; they raced there while competing in the Rolex Grand Am Series in 2006. Next weekend, the T-Team Ten will be looking to score points and show that they are the measure of any driver/team combination competing in the ICS in 2008. The rookie run of the Fine Nine continued its ninth start at qualifications in fairly good style. The short track yielded a few surprises along the way and a blend of drivers started to make a showing that even surprised some of the established teams. First off, Bruno Junqueira, read the riot act to his Dale Coyne team after not being able to compete last week in Iowa. His car crashed in Iowa and the team worried whither they would have it ready for Richmond or not. When they hit the track in Virginia, the rebuilt Z-Line sponsored car ran well and was able to qualify in the top ten at position 9. In a special Rookie practice held on Thursday, the current leader in the Rookie Of The Year point chase, Heideki Mutoh from the established team, Andretti Green Racing, elected NOT to participate. This didn’t bother his qualification though as he was able to clock in at position seven. The biggest surprise was delivered by the driver from Newman/Haas/Lanigan Racing who won the second race of the season by qualifying in position 3, right behind Andretti Green Teammates Tony Kanaan and Marco Andretti. RICHMOND, Va. - Tony Kanaan, the senior member of the Andretti Green Racing quartet, called a family meeting before the race earlier this week at Iowa Speedway. He wanted to clear the air, get everyone on the same page and communicate like the "old days." 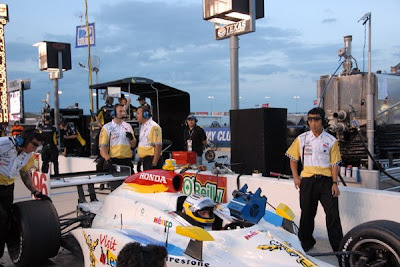 Aside from his mistake late in the 250-lap race after leading 71 laps, which resulted in a Turn 1 single-car crash, the team scored its best cumulative result in quite a while (rookie Hideki Mutoh was second, Marco Andretti third and Danica Patrick sixth). Five days later, the vibe continued at another short track - the 0.75-mile Richmond International Raceway. Kanaan posted a four-lap cumulative time of 1 minute, 04.333 seconds (167.876 mph average) in garnering the PEAK Motor Oil Pole Award presented by Advance Auto Parts - his first on an oval since last August (1.5-mile Kentucky Speedway). Andretti will start next to the No. 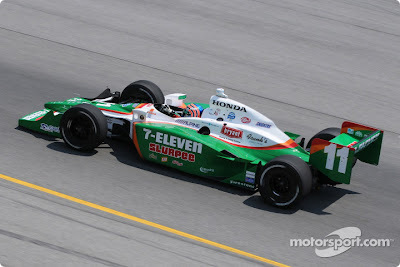 11 7-Eleven car in the 300-lap SunTrust Indy Challenge. They are separated by three 10-thousanths of a second -- less time than it takes to snap your fingers or blink. Don't blink on race day, whether you're watching from the grandstands or on ESPN, or you might miss just about anything. Andretti posted a four-lap average of 167.795 mph (1:04.3642) in the No. 26 Blockbuster car. It's the seventh time AGR cars have started 1-2 and the 36th overall in IndyCar Series history. Graham Rahal will start third (1:04.5740; 167.250) and IndyCar Series points leader Scott Dixon fourth (1:04.6242; 167.120). Buddy Rice recorded his first top five and top 10 starting position of the season (1:04.7467; 166.804) in the No. 15 Dreyer & Reinbold Racing car and will share Row 3 with Target Chip Ganassi Racing's Dan Wheldon (1:04.7606; 166.768), the winner at Iowa Speedway. Vision Racing's A.J. Foyt IV, who posted his first top five of the season at Iowa, will start eighth in the No. 2 Lilly Diabetes car (166.126) and Bruno Junqueira grabbed his best starting spot (ninth; 166.032) in the No. 18 Z-Line Designs car for Dale Coyne Racing. He'll share Row 5 with Oriol Servia (165.815) in the No. 5 KV Racing Technology car. John Andretti continued to post positive results for Roth Racing and will start 12th (165.275) - next to Team Penske's Ryan Briscoe (165.643) on Row 6. Helio Castroneves' streak of 11 top-10 starts came to an end. Castroneves, a two-time pole sitter at Richmond and second in the standings, will start 18th in the No. 3 Team Penske car. "Qualifying certainly is an experience," said Andretti, who has made more than 20 stock car starts at Richmond but none in the IndyCar Series. "I like the four-lap average thing. You've got to make it happen four times; you can't hold your breath for one lap and make it in. Richmond International Raceway doesn't even look the same when you're going around in an IndyCar instead of a stock car. We'll see how we race." A good and competitive race was held near the corn fields and flooding of Iowa. The race was won through pit stop timing and fuel strategy. Dan Weldon in the Target Chip Ganassi Dallara took the checkered flag on the day he turned 30 in front of an appreciative crowd looking for an escape from the acts of God tumult this region of the United States has suffered from in recent weeks. After 8 of 18 races, Andretti Green Racing’s Hideki Mutoh begins to lock down rookie of the year honors in the IndyCar Series championship by holding on to second place next to his teammate in third, son of the owner of the Andretti Green Racing team, Marco Andretti. To a fan of the former ChampCar, this is a very disappointing trend. The rookies are almost all drivers who drive for teams that made their calling card carrying on for a racing series that raced on a different type and configuration of race track every weekend. This was the fifth straight oval race in six weeks for the unified IRL drivers and, to be honest, the races are beginning to blend together. Cars try to run three (and maybe four) wide, tires in the open wheel cars almost touch (and sometimes do causing wrecks), suspension parts fail due to stresses of overloading the technology on tight lefthand corners sending cars into the outside wall, and at the end, the race will be won by one of three teams that have all the parts, back-up equipment, and teammates that will, hopefully, protect and keep them out of trouble. Next week is the track at Richmond, Virginia … which is just a slightly shorter version of this track here in Iowa … but with a little less banking, will see more of the same. The twist for Richmond (just like they did in Texas) is that the race will be run at night in the glow of specialized lighting. 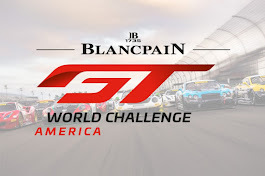 Unless the former ChampCar teams get an equalizing road course soon, and have five in a row to make things a little more even, this unification thing may begin to turn fans away, after all, there is still trouble getting all of the cars with sponsorship. Outside of the tradition a few oval tracks hold, the races play out pretty much the same no matter where one goes. There is not enough variation to really hold a rabid fans interest through the course of a whole season if every race has as its hallmark, higher banks, or shorter track, or the race will be held at night, or … this used to be a cornfield but now its an oval racetrack! 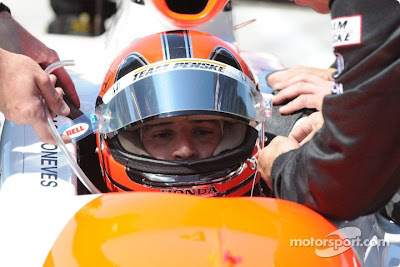 Dan Wheldon gambled on stretching his final fuel load for 90 laps and took an unlikely victory for Ganassi at Iowa Speedway, ahead of Andretti Green's Hideki Mutoh and Marco Andretti. The Ganassi cars had not been a factor in the lead battle for most of the race, but the decision to leave Wheldon on track as most of the leaders pitted under a late yellow allowed the Briton to vault to the head of the field. 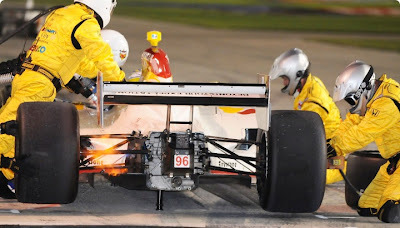 He then had to conserve fuel to make it to the finish - running 90 laps rather than the usual 75 on his last stint - but two further cautions in the closing stages allowed Wheldon and fellow fuel gamblers Mutoh and Danica Patrick to stretch their fuel mileage to the end. 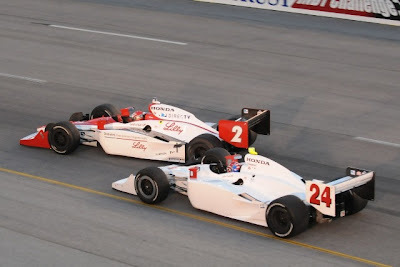 Wheldon was running back in the pack when he and strategist Barry Wanser chose to keep the car out on the track while the leaders came to the pits on the 187th lap. It appeared at the time as if Wheldon wouldn't be able to make it to the finish, but he received two huge assists - a yellow flag when Mario Moraes brushed the wall on a restart on the 197th lap and another when Tony Kanaan spun and hit the wall on the 211th lap. Wheldon donated his winnings to relief programmes for victims of flooding in Iowa. Coupled with Scott Dixon's $15,000 for finishing fifth, Ganassi's drivers donated a total of $50,000 to disaster relief efforts. 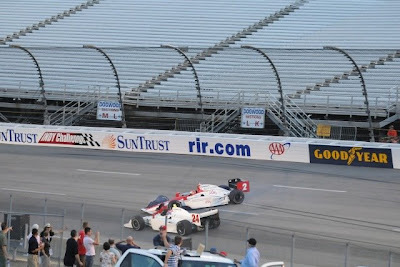 Andretti was the highest finisher amongst those who made the extra pitstop, having jumped past Patrick and Dixon in a single move at the final restart before hunting down Wheldon and Mutoh. He was unable to get around his rookie teammate, though, and had to settle for third, as Mutoh successfully managed to fend off Andretti while also trying to keep the pressure on Wheldon. "I almost got by Wheldon at the end, but I didn't have the speed to overtake him," Mutoh said. This is the highest finish by a Japanese driver (in the IndyCar Series), so it's good news for Japan and for myself, too." Despite these incidents, the race was a far cry from last year's crash-filled and processional inaugural Iowa event. This time, the race featured six cautions for 57 laps, but 17 of the 24 starters were running at the end. The other significant yellow came when Ed Carpenter spun in Turn 2 on the 39th lap, then blamed Patrick for his accident. "Danica did her normal supreme block job," Carpenter said. "She is the new Scott Sharp of the series, as far as I'm concerned. That is two races in a row. I'm over her." KV Racing's Will Power and Newman/Haas/Lanigan's Graham Rahal completed the top ten. John Andretti showed encouraging pace for the small Roth Racing team to run as high as seventh, while Justin Wilson (Newman/Haas/Lanigan) also occupied that position in the middle of the race, before both lost ground in the last stint. How did the surviving eight drivers (of ten registered to compete) from teams that have transitioned from the CCWS? Bruno Junqueira of Dale Coyne Racing and Mario Moraes’s teammate hopes to have his damaged car ready for Richmond. No word at the time of this post if Pacific Coast Racing’s Mario Dominguez will make the show in Virginia. If I were in the business of speculating, I’d say the chances are better than 50/50 that PCM may wait until Watkins Glen to rejoin the frey for the balance of the 2008 season, the week after the short oval at Richmond. 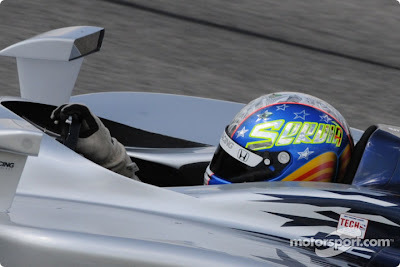 The eighth race of the 2008 season is proving hard to make for a couple of drivers from teams that are transitioning from the ranks of the ChampCar World Series to the IndyCar Series. 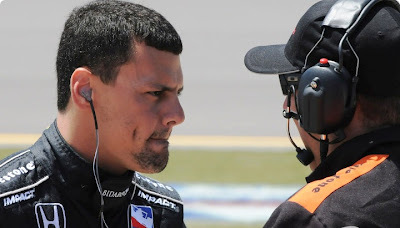 Mario Dominguez of Pacific Coast Motorsports and Bruno Junqueira of Dale Coyne Racing will not be able to make it into the field of the Iowa Corn Indy 250 presented by Pioneer, both for different yet similar reasons. It is no secret that the teams that are new to the series do not have the same availability of parts, especially oval track aero parts, as do established teams that have been working with this Dallara chassis now for the better part of seven years. Heck, some of the teams may even have extra parts they have forgotten about that the kids are playin’ with in the backyard at home (more about kids, later). Resource management and preparation kept the Pacific Coast Motorsports team at their headquarters here in Southern California whereas Bruno will join Marty Roth on the sidelines due to accidents each driver had in separate incidents in the morning practice session on the 0.894-mile Iowa Speedway tri-oval. Bruno Junqueira, after the car was hooked-up and brought bach to the pits, speculated that he hoped the car would be ready for the next race in Richmond, Virginia. 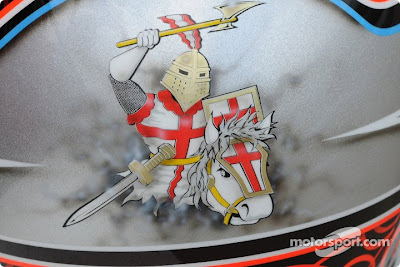 Furthermore, the qualifications were rained out after only two qualifying runs by Ryan Briscoe - Penske Racing, Dan Weldon - Chip Ganassi Racing, and a third partial run by Helio Castroneves - Penske Racing was waived off. After that, the session cancelled. So, by virtue of his superlative season so far, Scott Dixon - Chip Ganassi Racing will start from the pole in the Iowa Corn Indy 250 presented by Pioneer based on entrant championship points accrued so far at this point in the season - Starting Grid. Both cars sustained parts failures, which led to the cars spinning into the SAFER Barrier in Turn 2. "We had some steering rack problems in the run before and had someone vibration," Junqueira said. "I'm OK. Unfortunately, the car's not OK. It's very damaged. The left-rear wishbone broke, which is what made me spin. Hopefully we can get everything together for Richmond." 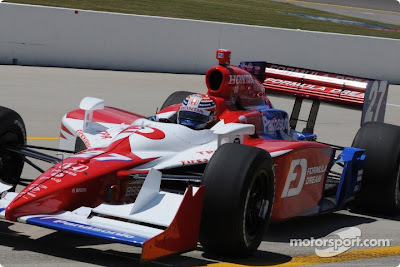 The Target Chip Ganassi Racing crew prepared Wheldon's back-up car for qualifications for the second race in a row. Milka Duno, who crashed during the Open Test on June 20, also will compete in the No. 23 back-up car. The Iowa Corn Indy 250 presented by Pioneer is the first of six consecutive weekends of IndyCar Series racing. The SunTrust Indy Challenge at the 0.75-mile Richmond International Raceway oval is under the lights June 28. Speaking of kids, Jamie Camara of Conquest Racing will have the first increase in his family planned to be delivered June 25 … it’s a BOY! Newman/Haas/Lanigan Racing is expecting two newborns in the near-term as well. Race Engineer, Mike Talbott is expecting his second within the next few days and will be replaced in Iowa by Senior Engineer Craig Hampson, who will return home after the race to receive the coming of his family’s second. As for the grid of the Elite Eight, the highest position on points going into the eighth race of the season goes to Oriol Servia at 10th position. 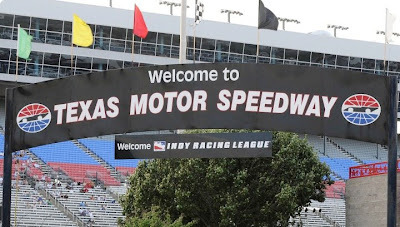 The last IndyCar Series race in Texas proved to be a successful outing for the driver and team of Pacific Coast Motorsports. 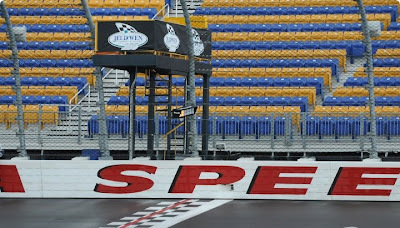 What team owner Tyler Tadevic was able to conclude by completing a full race on the high-banked one and a half mile oval track is that with limited resources, it might be better to take extra time and prepare the two Visit Mexico City Dallara cars in a proper way with the expectation that it would be better to compete through chasing the season as opposed to having the season chase them. So, instead of hitting the road on to Iowa and beyond for the next seven weeks, why not miss a race or two and rejoin the frey with the preparation and knowledge gained by the kind of shoptime a sponsored effort through the end of the 2009 ICS season would suggest. “Pacific Coast Motorsports and the Mexico City Tourism Board are committed to IndyCar. PCM has a contract with Mexico City through 2009 and this has always been our building year." Along with our partners, we have determined we are going to take some time to re-evaluate our resources and determine how to strengthen our 2008 program and better prepare for a competitive 2009 season,” said Team Owner, Tyler Tadevic. 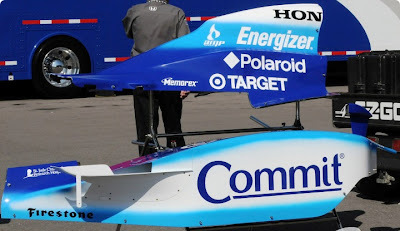 PCM was the last of the Champ Car “transition” teams to debut in the IndyCar series. Coming off their first podium finish at the Long Beach Grand Prix, PCM ran their IndyCar for the first time during rookie orientation at the Indianapolis Motor Speedway. Despite a valiant effort throughout the month of May, the team did not qualify for the 92nd running of the Indy 500. One week later they made their first IndyCar start at The Milwaukee Mile. Experience, hard work and professionalism paid off for PCM at Texas Motor Speedway, two-weeks ago. Mario Dominguez and his crew enjoyed improved results at the 1.5 mile-speedway. Dominguez started 24th of 28 cars and finished the event in 21st position. While these are not the type of results Dominguez or his crew are used to, they were proof of PCM’s expedited effort in learning and developing the set-up and strategies for their new environment, the IndyCar Series. Tadevic continued, “In light of where we are in our effort and the limited resources available, there is no sense in taking risks which could put us further behind. We came into the series late and we cannot compete for a top-ten position in the championship this season, so we are taking this time to build our second car and to focus-on and prepare-for the job ahead." 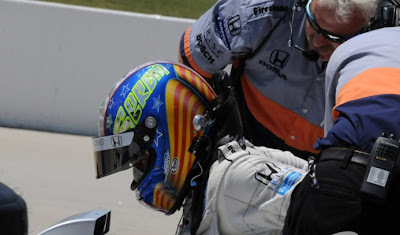 "The transition has been extremely difficult, especially with the intensity of the IndyCar schedule. Despite our late start, we have been able to compete and garner publicity for our partners in Mexico City. We’ve also enhanced the fan base for the IndyCar series. 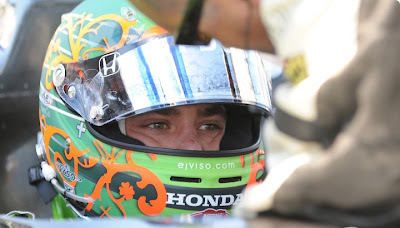 The series has been very supportive and we look forward to our future in IndyCar,” said Tadevic. Fans in Southern California and Mexico all look forward to the day when Mario Dominguez and the team at Pacific Coast Motorsports are able to take to the track, buttoned down and ready to go. In the most recent edition of the run for the world championship of Formula 1 open wheel racing, Canada and the track at Montreal proved to be a study in preparation and strong driving for Toyota. The drives put on by both Timo Glock and Jarno Trulli of Panasonic Toyota Racing was quite impressive once one realizes that Glock qualified in position 13 and Trulli at 14. In F1, to be able to score any points at the end of the race from these starting positions is very rare especially since in F1, only the top eight finishing positions are awarded points. It did not hurt that during the race, four cars that qualified ahead of them found trouble on the track and had to bow out due to accidents, but this does not completely explain how Timo Glock and Jarno Trulli were able to move up nine and seven positions respectively. On track performance, incidents, strategy, and off-track preparation all combine into a perfect storm of performance and this video produced by Toyota gives insight to a form of car preparation beyond the wind tunnel. The majestic sight of Panasonic Toyota Racing’s TF108, sweeping through corners at speed, is the public face of Formula 1; but away from the Grand Prix track there is another, hidden world of continuous technical development – a world that increasingly relies on digital simulation. "I think we live in a digital world now. We have to recognize that; and, in Formula 1, we are pushing the limits of simulation and the utilization of computer power to absolutely understand where the performance can be found in the future. So even if we still use track testing or wind tunnel testing normally, the area we’re looking in is pre-defined by computer simulation. 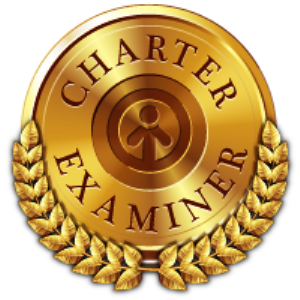 And we’re looking in a fruitful area where we can cultivate performance." states, John Howett, President, Panasonic Toyota Racing. 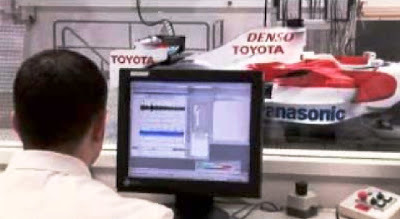 Simulation technologies are used by many departments within Panasonic Toyota Racing. It’s a sophisticated system of hydraulic rams that can exactly recreate the suspension movements of any of last year’s Grand Prix races. It’s particularly important for the race in Montreal. Chief Engineer Race and Test, Panasonic Toyota Racing says, "It’s very important because, contrary to other circuits, you have the chicanes where the more you can ride the kerbs the more you can straight line them, and the more time you're gonna gain. That means if you have a car that handles perfect over the kerbs you take them with you and you're going to gain a lot of speed and lap time, just only in the chicanes which you don’t have to gain on the rest of the circuit." All of these assets for testing strategies paid off. The Circuit Gilles Villeneuve invariably delivers a dramatic race and the combination of on track performance, incidents, strategy, and off-track preparation all combined to deliver a perfect storm of performance for Panasonic Toyota Racing's Montreal (digital) Reality Check with Timo Glock placing fourth and Jarno Trulli a sixth. The best thing that could be said for a race that was shaping up to be one of the most exciting in terms of finishes was that most of the T-Team Ten improved position over their qualifying placement in the grid. All of the drivers raced well; however, the three drivers who had to retire from the race due to contact did not take others out with them...another good thing. On lap ten, Mario Dominguez of Pacific Coast Motorsports / Visit Mexico City spun all of the way around and, apparently … according to the announcer, did not touch anything. “We now have our first IndyCar race in the books and Mario did a great job. He had a great start and a strong first stint, he picked up three positions. Unfortunately, he spun but his skill kept it off the wall and kept the car running. He brought it to the pits for a fresh set of Firestone tires and rejoined the race on the same lap. He developed a handling problem after the spin, which after taking a look at the car, we found that he actually did brush the wall and it bent the rear wing just a little bit and also damaged the right rear shock. Unfortunately that damage created a push. We didn’t realize that the car was damaged, so we didn’t know that was what was causing the push. We thought it was a handling issue, so we added front wing which actually slowed Mario’s pace despite him being full throttle. He did a great job all night out there. The crew made great pitstops. They battled a sticky valve on the fuel rig which slowed down one stop, but they were able to remedy it. Lap 55: Yellow for spin out of Turn 4 by Mario Moraes Dale Coyne Racing / Sonny’s BBQ. Lap 56: Contact was between Tomas Scheckter and Mario Moraes in Turn 4. Scheckter is back out. Mario Moraes was able to get out on the track with repairs and finish the race running 18th. With just 18 laps to go (Lap 210) Enrique Bernoldi Conquest Racing / Sangari crashes and has to retire. 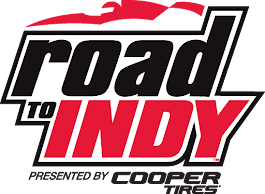 Scott Dixon passed Marco Andretti for the lead with six laps remaining, then idled to victory under caution after Andretti crashed with Ryan Hunter-Reay with five laps remaining in the Bombardier Learjet 550k. The victory was Dixon's third of the season and sixth podium finish in seven races this season, increasing his IndyCar Series lead over runner-up Helio Castroneves to 35 points. Dixon trailed Andretti on a restart with nine laps remaining in the 228-lap race but passed him for the lead with six laps left. A lap later, as Andretti and Ryan Hunter-Reay battled for second, their cars crashed hard and hit the wall. Hunter-Reay was OK, but Andretti sustained minor injuries to his right foot. X-rays were negative, but Andretti was limping noticeably after the race. 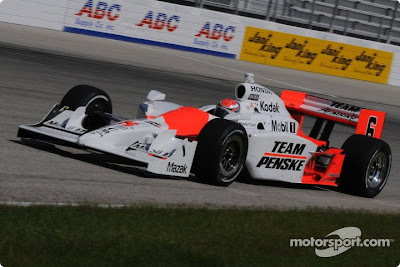 Following Dixon and Castroneves to the finish line was Ryan Briscoe, who lost a lap earlier in the race when he missed his pit box and was penalized, and Dixon's teammate, Dan Wheldon, who finished fourth despite an ankle injury to his right foot sustained Friday during practice. The win was anticlimactic proof that Dixon and his Target Chip Ganassi Racing team are the class of the series so far this year. He has led 633 of 1,327 laps in the first seven races, and, with Wheldon‘s win at Kansas, Ganassi's team has won four of the first seven races of 2008. "At the end, he left it wide open," Dixon said of Andretti's move up the track that gave Dixon space to move underneath. "I don't know what he was doing. Marco's car was good on the high line, so maybe he couldn't sit on the bottom. If it was me, I wouldn't have given up that much room. 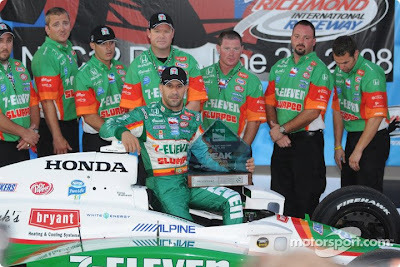 Tony Kanaan finished fifth, Hideki Mutoh was sixth, and Vitor Meira, who led a stint until he was forced to pit with 21 laps remaining, finished seventh. Buddy Rice, Ed Carpenter and Danica Patrick rounded out the top 10. The key moment of the race forced a second consecutive race to end under caution and left one driver hobbling and another fuming. After Dixon passed Andretti for the lead, Ryan Hunter-Reay began to pressure Andretti for position. 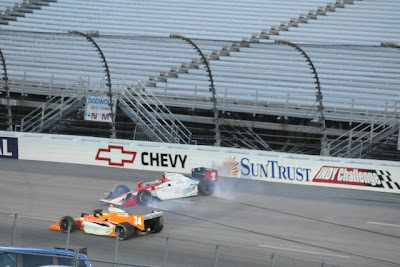 As Hunter-Reay moved inside Andretti in the entry to Turn 3 with five laps remaining, Hunter-Reay was forced down onto the apron and lost control, sending both cars into the wall. "He came down on me," Hunter-Reay said. "I went low to try to avoid him and got down on the white line. That upset both cars and took us out. ... This was going to be our breakout night and we didn't get it. 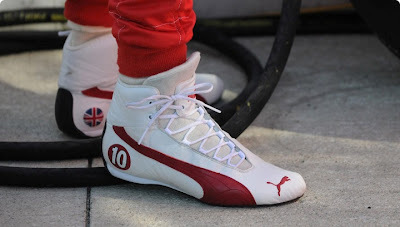 Andretti was seen favouring his right foot as he walked. It was the second time in six days that an IndyCar race ended under caution because of a crash involving Andretti. At Milwaukee on Sunday, Andretti apologized after his car slid into Ed Carpenter's and caused a three-car crash that led to Briscoe winning under caution. This time, Andretti wasn't apologizing. "There are some guys you can run close with and some guys you can't," Andretti said. "He clearly hit the white line, and that is that. We ran well today, but to me, that doesn't matter. We need to bring home results. It's very disappointing." 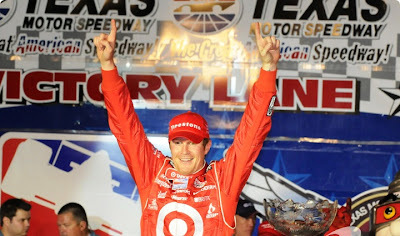 The race tied the Texas record for cautions in an IndyCar race - eight for 52 laps. 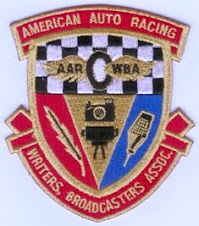 The yellow-flag ending also renewed the debate about the series going to green-white checkered restarts to prevent races from ending under caution. "I saw some of the fans walking out before the checkered fell," said Ganassi, an advocate of a green-white-checkered rule. "It's just disappointing. They come to see a show and they deserve to see a good finish. "They deserve to see an exciting finish. I understand the differences between IndyCars and NASCAR and why some people think you can't do it here, but I think we need to sit down and figure out a way to do it so it's fair for everybody." The series takes a week off before resuming June 22 at Iowa Speedway, kicking off a stretch of six races over six consecutive weekends. Qualifications of Round 7 of 18 in Texas for the Bombardier Learjet 550 were pretty tough for the Transition Team Ten. Unlike the good representation of having five drivers make it onto the grid in five of the top ten positions, only one driver was able to crack the top ten. 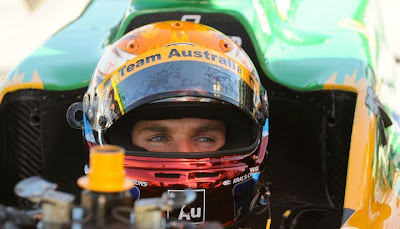 Will Power driving for KV Racing Technology/AU-Australia was only able to notch eighth in the grid, followed next closest by his teammate Oriol Servia in position sixteen. 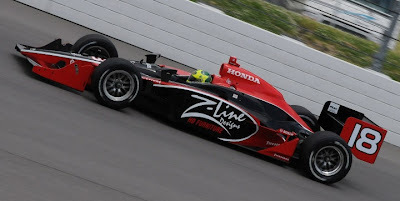 In his qualification run, Mario and PCM were able to place the car 24th on the grid right behind Justin Wilson of Newman/Haas/Lanigan Racing/McDonalds and ahead of onetime INDY 500 winner, Dreyer & Reinbold Racing driver, Buddy Rice. This was positive, since all of the practice times that his Dallara was able to post would have placed his car 28th in the field of 28 cars. This is the kind of performance that most of the established IRL pundits had prophesied … a bunch of “Rookies” cruising along at the bottom of the grid. 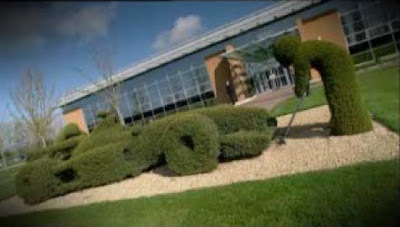 On average, Williams F1 builds seven chassis per season. Over a thirty year history, that's a lot of cars, so, what do we do with them? 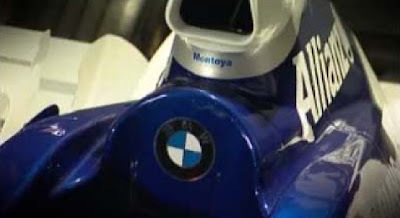 In a video released by AT&T Williams, the race team takes you behind the scenes at Grove and into their Williams F1 Grand Prix Collection and museum workshop. The collection features the most successful racecars from the 30 years of the team’s history. Cars shown were driven by Allen Jones, Jacques Villenueve, Nigel Mansell, Juan Pablo Montoya and one experimental chassis that sported a six-wheel design. 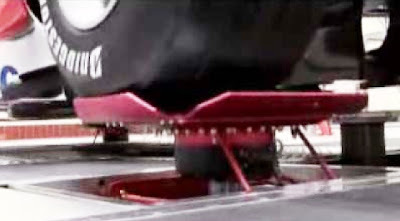 The "Star" notation next to the chassis nameplate is explained. "We at AT&T Williams are excited to open our doors and show our fans that building a Formula One car is an exciting, organic process that requires dedication and application from all of our 500-strong team. This programme does just that." commented Scott Garrett, Head of Marketing, Williams F1. The Milwaukee Mile proved to be a very tough place for many of the T-Team Ten. Mario Dominguez and the Pacific Coast Motorsports team could not get a clue as to how to get any speed or handling out of their Dallara all weekend long. Virtually last in qualifying and after hobbling around the track for half of the race, Mario and the PCM team thought it best to park the car for the balance of the race. 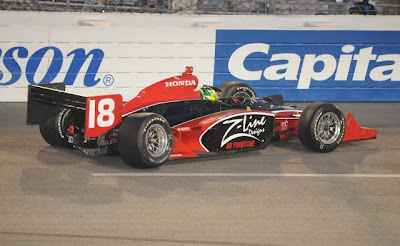 There were five transition team drivers to make it into the top ten of the starting grid, but the lead driver of the group, Graham Rahal, did not finish the race. The first half of the race, Graham showed well staying in the top five positions most of the time but then drifted high off of the driving line on the track and glanced the wall, crushing his right side A-Frame. Oriol Servia, Justin Wilson, and EJ Viso finished 6, 7, and 8, respectively but they were helped into the top ten by an accident started by Marco Andretti when he tapped Ed Carpenter sending both cars spinning. When Marco’s car was turned 180 degrees on the track, Vitor Meira’s car rode up the nose of the car and was launched into the air and collapsed onto the track to slide up against the outer wall to a stop. 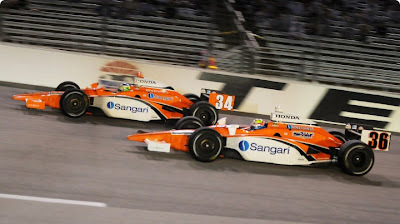 Ryan Brisco was leading the race and INDY 500 winner, Scott Dixon at the time and was able to win the race under the Yellow caution flag. Ryan Briscoe fended off championship leader Scott Dixon to score his first IndyCar Series race win at the Milwaukee Mile. Penske driver Briscoe worked his way into contention in the second half of the race after falling as low as 14th early on. With 70 laps to go, Briscoe was up to third place, then overtook teammate Helio Castroneves and then Dixon in quick succession to hit the front on lap 176. After briefly losing ground to Briscoe, Dixon closed right back in and put the Penske driver under enormous pressure through the traffic in the closing laps, briefly drawing alongside on the outside on lap 220 of 225. But when a full course yellow came out with three laps to go following a dramatic multi-car incident, Briscoe was able to clinch his maiden win and put last week's controversial Indianapolis pit lane crash with Danica Patrick behind him. 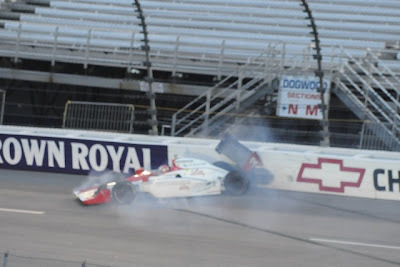 The only other major incident prior to the late crash was Graham Rahal's impact with the wall on lap 130. Newman/Haas/Lanigan's rookie had been running a strong third before understeering into the barriers in traffic. Oriol Servia charged back through the field to take sixth for KV Racing despite having to pit for a new front wing on lap one, with fellow 'transition' drivers Justin Wilson (Newman/Haas/Lanigan) and EJ Viso (HVM) also putting in strong runs to seventh and eighth. Danica Patrick and Buddy Rice completed the top ten. 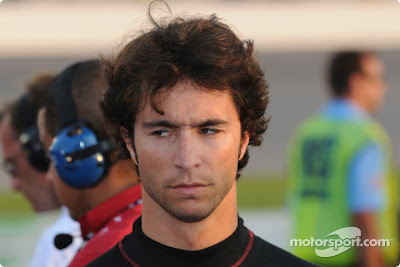 Driver Points Standing Here - By finishing in the top ten, Oriol Servia surges into the Rookie Of The Year points lead. Next week it's the high banks of Texas for the T-Team Ten!